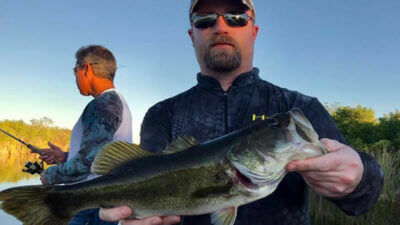 When you are visiting Florida and looking for the ultimate outdoor adventure, bass fishing is the way to go. Freshwater fishing is booming and each day is getting better. Every trip is a true experience that you may have never done before. The Florida Everglades is the perfect spot to bring your friends and family on a fishing adventure of a lifetime. Hop on board to enjoy an Everglades Largemouth Bass Trip with our local experts right here in sunny South Florida. One of the best parts about the Florida Everglades is the ability to access from the South and the Southwest coast. 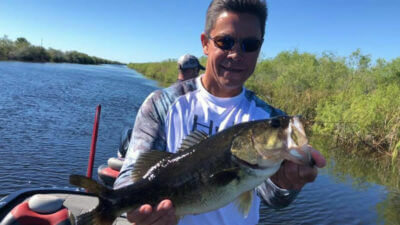 All along alligator Alley you can catch big numbers and quality largemouth bass. 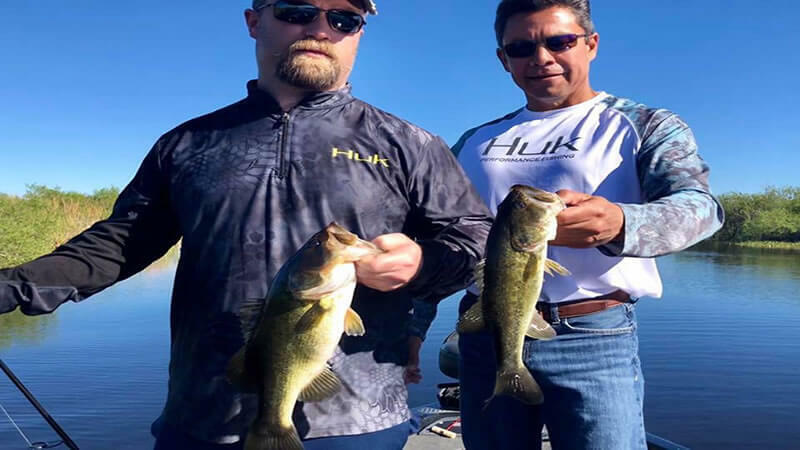 Our local experts have spent a lot of time on the water dialing in what works and what doesn’t so that you can enjoy catching bass all trip long. peacock bass. 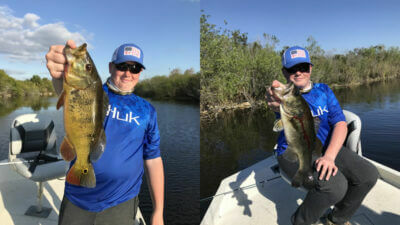 One of the cool parts about the Everglades especially at Mile Marker 41 is that you can catch peacock bass. Leslie and Stewart came down on one of our cold fronts but they still managed to land several quality peacock bass. They also caught over 50 largemouth bass. All of these fish were caught on artificial baits. 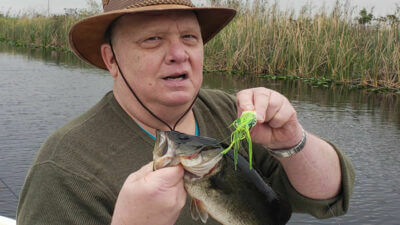 The most productive method to catch bass in the Everglades is a soft plastic worm or topwater baits. Leslie and Stewart had a great time on the water and will be back in the near future! Captain Nick is looking forward to their next adventure! Just shortly after this fishing trip, Captain Joe Gruny was out on Alligator Alley. He had the pleasure of fishing with Wayian and his friend Mike. They were traveling from Houston, Texas looking to catch some largemouth bass in the Florida Everglades. It was a short 4-hour fishing trip with a lot of great action from some big bass! Wayian and Mike had a fantastic day in the Florida Everglades. They caught over 38 largemouth bass with some big bass in the boat. The biggest bass of the day weighed close to 4 pounds. You can’t beat the non-stop constant action while fishing these canals. These gentlemen are looking forward to getting back on the water here in Florida catching even more bass on their next trip! It was not long after this trip that Captain Rick Mitchell was on the water on Alligator Alley. He had the pleasure of fishing with Tony and his wife that were interested in catching bass and taking pictures. While traveling to Florida to enjoy the sun, they had to get in the outdoors. Originally, the trip was set for the Golden Gate Canal System in Naples, FL but then changed to the Everglades. Luckily for them, they had the ability to take more pictures and enjoy the outdoors. It was a slower morning but once the sun started warming things up, the bass started eating. Soft plastic senkos and topwater frogs were the key on this fishing trip. Tony and his wife had a blast catching bass on their trip and are looking forward to their next adventure with Captain Rick! Don’t miss out on your fishing adventure in the Florida Everglades! Florida has a lot to offer when it comes to bass fishing. Take your kids on a fishing trip of a lifetime with our local experts. We look forward to seeing you on the water next time!